In the niche world of sipping whisky, there's a lot of disagreement (and heated debate) around what the "best" whisky is. Any whisky enthusiast who's ever been to a wedding has undoubtedly encountered a drunk uncle who slurs at length about how such and such a Single Malt Scotch is "proven" to be the best whisky in the world. Now it may be tempting to enlighten uncle Gord on the finer points of individual palates, the subjectivity of taste and so on, but he won't listen to you anyway, so you may as well save your breath. If you haven't heard about this Canadian Rye, you've probably been living under a rock. 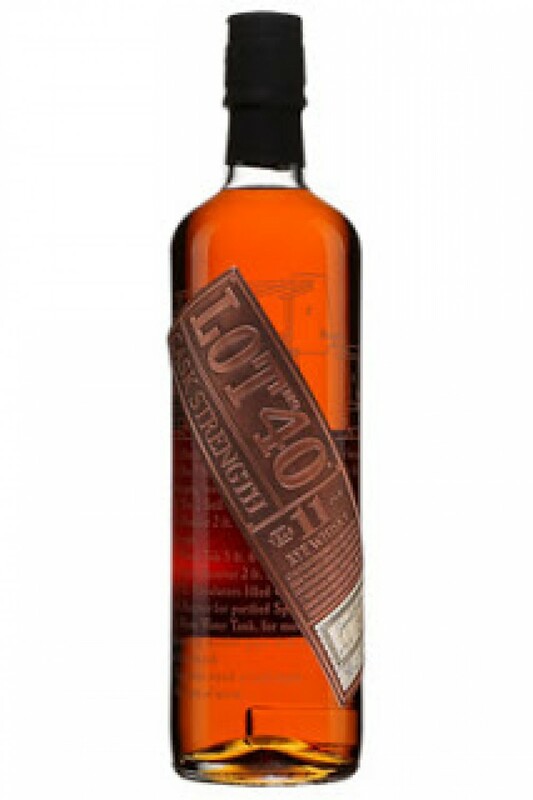 According to my online exchanges with Dr. Don Livermore, Lot no.40 Cask Strength is produced from 100% rye grain, is distilled first in a column still (like all spirits produced at the Hiram Walker distillery) and then distilled a second time in a copper pot still. It was then aged in charred virgin oak casks for at least eleven years (for the 2018 release). Now some more astute among you may be saying "Hmmm, first column distilled, then copper pot distilled: isn't that like bourbon or American rye?" The short answer is "no". A copper pot still is different from a "doubler" or a "thumper" used in bourbon and American rye distillation. Nose (undiluted): much deeper in flavour than the 2017 release. Lots of deep dark toffee/brown sugar up front, there’s something suggestive of a good quality dark rum, the rye grain and clove notes are present, but are farther back. There's also a floral (violets? ), slightly fruity aroma in the background (blackberries?) that really rounds out the nose. Delightful. With time in the glass, some toasted oak aromas develop. Finish: long and warming, cloves, a slightly herbal note (spearmint, maybe? ), fresh tobacco, black tea, toasted oak, sweetened coconut and caramel lingering. Adding water brings out more floral and spicy aromas on the nose. Even with water or (dare I write it?) ice, the whisky retains all of its rich, full-bodied character. The finish isn't quite as complex with ice added, but I tend to drink my whiskies neat. Adding ice is usually just a move to make my drinks last longer so I don't get carried away. And while I'm confessing my whisky sins, I admit I have made an Old Fashioned with this whisky and it was glorious! I'm not even sorry. With Lot 40 Cask Strength poised to be a regular occurance, the debate will no doubt rage on about which year's release is "best". It's hard to choose one over the other since they're both terrific and I see no reason to think the 2019 release will be anything short of exquisite. But life is full of hard choices. To my palate, the 2018 Lot no.40 11 Year Old Cask Strength Rye is an even more satisfying whisky than the outstanding 2017 edition. Great review! I've not had this bottle, but I can concur the 12yo CS last year is magnificent as well! Also good to hear that Dr. Don does correspond with some people! I tried to reach out to him with no such luck...nothing personal as I'm sure he is a very busy guy! @dloewen He is very busy and his replies are quite short, but precise and to the point. I've had quite a few exchanges with him on Twitter and on Instagram (@cdnwhiskydoc). I admit that I'm a bit of a Dr Don fanboy. He's also been on the Whisky Topic podcast a few times. Dr Livermore is far more forthcoming than most people working in whisky these days. He's a scientist, not a brand ambassador (aka salesman) so his takes are not just "market-ese" gobbledygook. @OdysseusUnbound Trust me, you're not the only "fanboy" in these parts! Anyone who's been watching the change he is making in Canadian whisky on the world stage, owes him credit. @OdysseusUnbound - His approach, seen from afar at least, seems to reflect the ideology, and to a lesser extent the practices, at Springbank. By that I mean the focus is all about how to make the best whisky; do that and it should sell itself (given enough time for the word to get out). This approach is most pleasing for someone who enjoys appreciating the craft; and it's very refreshing to see such openness and honesty from the producers as opposed to flash marketing that far too often is, let's be honest, used to mask less than stellar iterations. @dloewen As far as I know, Dr Livermore works on the JP Wiser's and Corby brands, so JP Wiser's, Lot no.40, Gooderham & Worts, and Pike Creek. I'm not sure about Gibson's Finest, Hiram Walker Special Old, or Canadian Club. CC is a weird case study, as it's owned by Beam Suntory. Some of its whisky is still made at the Hiram Walker distillery in Windsor and some of it is made by Alberta Distillers in, you guessed it, Alberta. @paddockjudge is the in-house expert who could properly answer your questions. @RianC You mean naming whiskies after strippers, er, exotic dancers, was just a slick marketing ploy? I'm shocked, I tells ya, shocked !!! 99.52% of the earth's population lives under a rock, apparently, which is to say outside of Canada. quora.com/What-percentage-of-world-populat… Stats as of 2015. Really, @OdysseusUnbound! And you thought that those residing in the GTA (Ontario-speak for Greater Toronto Area) were egocentric. Canadians speaking with Canadians about something only available in Canada is not 'everybody'. It is almost nobody. 1 person out of 200 living in this world. 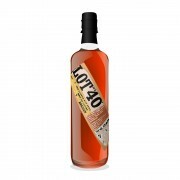 This is very good news that there will be more releases of Lot 40 Cask Strength, or what I like to think of as "The Great Canadian Hope". The much bigger and much more important question with this and with all top tier whiskies remains, will people, i.e. I, be able to obtain the stuff and not at a scalper's price? Thanks to our Sudbury friend I will be able to get some of this whisky, but it is impolite to speak of 'this great stuff we are drinking' to a large international audience who have very little chance of being able to drink it. Hopefully Lot 40 CS production will be expanded as well as prolonged. But long-term I see it as likely getting scarcer rather than more available, just as has happened with all the top tier US products once they got well discovered by the general US population, not to mention the international population. Canadians, now is the time to put a few bottles away. It might become very difficult to do so in a few years. @Victor - Canadians, now is the time to put a few bottles away. It might become very difficult to do so in a few years. You may well be bang on the money, sadly. Hope not though . . .
@Victor It is my experience that "most" people in the whisky-sphere have at least heard of Lot 40. If not the Cask Strength stuff, the "standard" 43% offering is becoming more well-known. @OdysseusUnbound - 'Float like leaf on river of life . . . Kill old lady!'. @OdysseusUnbound oh I do understand the desire to flow with the flow of the new whisky releases of life...but, only a few of those ongoing new releases will be, by definition, exceptional. This is the difference, once again, between researching the breadth of the field in order to know the field, on the one hand, and honing in on favourites for the sake of continuing to enjoy them for years to come, on the other. It is nice to have the exceptional continuously available on one's shelf. @RianC I HAVE put some away but not enough. I have given 2 bottles as gifts to worthy friends (1 from each year). With each batch different it will be impossible to collect enough of each to last forever. Also, @RianC, sorry, I haven't seen the Ladykillers. @dloewen, I am by no means an expert, but I can tell you this about Hiram Walker; You will not get information about CC or Gibson's from Corby's employees, that includes Livermore. Beam is now a tenant in what was at one time their house. I can confirm CC 40 was bottled at Windsor, I saw it with my own eyes. Somebody in Windsor (physically) blended the CC 41 YO and there's a good chance it was the same team that blended W 35. Some bloggers are saying CC 41 was aged (or perhaps finished) in rye barrels. I don't think this is the case. It is so much easier to add rye and sherry to the corn whisky and then bottle it. Please correct me, anyone, if you have evidence to the contrary. @paddockjudge "Beam is now a tenant in what was at one time their house." that's the best resume of their sad state of affairs I've heard. Makes me wonder if they plan on eventually moving over to using all ADL juice in the future. @Nozinan - Impressive, good sir! @cricklewood I’ve left comments on ADL’s Instagram photos regularly, calling for them to release an age-stated, Cask Strength Rye. The “standard” bottom shelf Alberta Premium in the kitschy bottle is shockingly good in its own (I think I rated it 84-86 points) and a 15 year (or 25 year? 30 year) Cask Strength would be awesome. @OdysseusUnbound, now you've thrown my weekend under the bus. I'll be wondering what could be extracted from the ADL stocks in Calgary......I thought I was passed that.